Waist Suit and Lined Jacket - Buy Now! 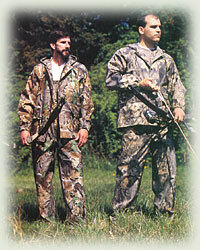 This camouflage rainsuit includes durable elastic waist pants that feature tapered legs that close against the elements and a lightweight lined jacket. Both waist pants and lined jacket feature durable, breathable fabric and include spacious storage pockets.